I thought I’d put a quick spotlight on something I’ve only mentioned in passing before (and that allows me to recycle some old videos): Decapping honey frames with a heat gun instead of a decapping knife. For anyone who came late: Honey bees store honey in wax cells like little Mason jars. Mason jars aren’t cheap and neither are the lids, so the bees simply seal them with wax. These wax lids are called caps. When the bees get hungry for honey, they chew threw the wax caps and dig in. When humans get hungry for the honey, they can’t chew open the comb because that’d be silly. Instead they remove the wax caps with a long straight blade sometimes referred to as a decapping knife. Then they put the frames full of opened honey combs into a machine called an extractor that whips the honey out of the cells through the use of centrifugal force — by spinning it really fast. The honey then drips down into a bucket and the humans eat it. 1) It’s cheap as dirt. An electric decapping knife goes for about $150 before taxes and shipping. I paid $30 for my heat gun. 2) It’s quick and easy to use and it doesn’t leave behind any kind of mess. An electric decapping knife requires careful attention so you don’t burn yourself or the honey, and although it may be a little quicker to use once you get used to it, it makes a mess. You’re left with honey and wax to clean up afterwards. Some people don’t mind all that left over wax. They use it make a variety of creams and cosmetic products. But I don’t. I’ve had no problems extracting honey from frames that were decapped with a heat gun (and the bees have no problem refilling the frames afterwards). Sometimes I scrape the caps with a fork as well (yup, a regular old kitchen fork) just to be sure the caps are unsealed. That takes an additional three seconds. Big deal. So this is me, Phillip, the curator of all beekeeping things a la Mud Songs, giving a big thumbs up to depcapping honey frames with a $30 heat gun instead of a messy $150 decapping knife. Here’s a cell phone video of me pouring some honey that I extracted using my home made honey extractor. The sound and video quality isn’t the best and it’s not smoothly edited. It’s also a little repetitive, but it demonstrates a cheap and simple method of filtering honey and you’ll hear me blather on a bit about the difference between blended honey and single-colony honey. Anyone who appreciates single malt scotch over blended scotch will know what I mean. And if you want a better view of my flawed-but-functional extractor in action, check out my DIY Honey Extractor video from last year. By the way, the heating gun method of uncapping the honey works great. No fuss, no muss and way cheaper than an uncapping knife. 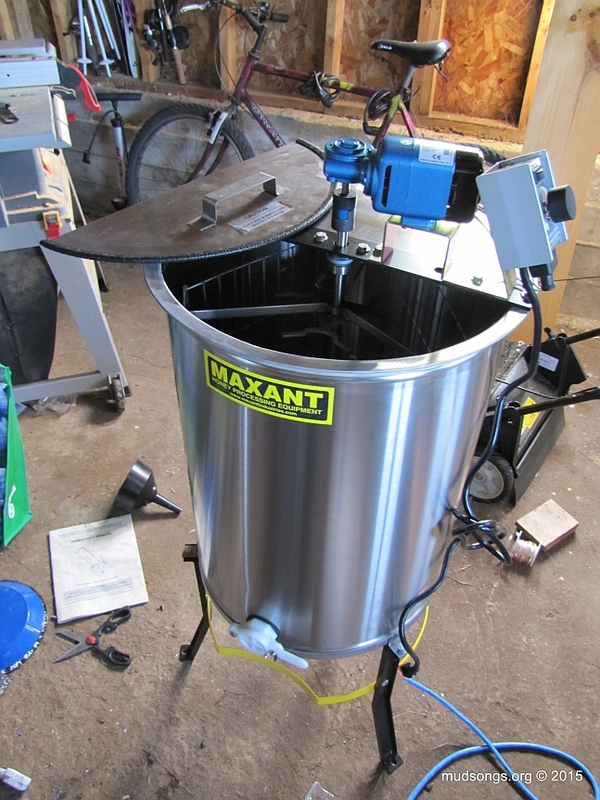 AUGUST 13/14: I just uploaded these photos of the extractor for anyone who wants to try to figure out how I built it, though I don’t recommend it.